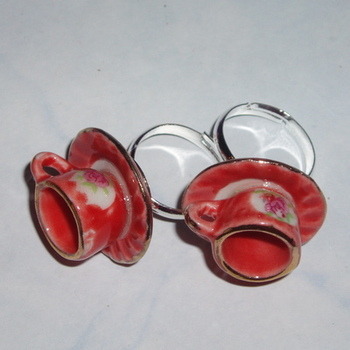 Miniature Dolls House Teacup Ring. Dark Peach with Roses Teacup and matching Saucer are securely attached to an adjustable silver plated base. Made of glazed porcelain. The Saucer measures about 25mm across. Totally 'Alice' and so in fashion.